I went on a trip to the tail of the dragon recently. It was a good vacation in the mountains and hills of North Carolina and I wanted to share my good experience with a local company in Maryville Tennessee if anyone is interested in something similar. I drove up there with my wife in her Nissan Rogue and got to this really winding road headed up through South Carolina into NC headed towards Brevard. I was immediately ecstatic due to the sheer quality of the roads and the nice variety of turns I found just on my way to the cabin I was staying in. A good part of the trip was spent relaxing there in the mountains, but I had planned a strategic trip through the smoky mountains to Tennessee to hop on a bike in Maryville and head to the Dragon. 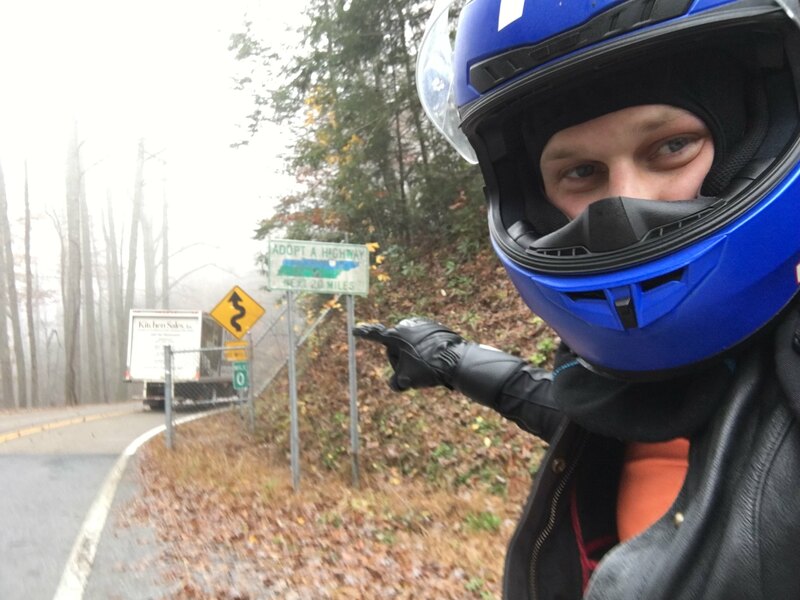 Fall/Winter is definitely not a terrible time to ride the tail of the dragon but per locals the weather can be spotty and temperamental with fog which limits some of the more scenic rides. Regardless, I decided to pick a day and ride, come rain or shine. November 8th is the day I decided on, for a number of reasons, the first of which was it is my late younger brother's birthday. He was killed in a motorcycle wreck near Fort Bragg about 5 years ago. The second being it was the middle of the trip and my wife was looking to find things to do outside of the immediate vicinity. Ok, so I rented from Sport Bikes 4 Hire.com and they had a number of motorcycle choices available, including FZ , GSXR, Ducati, and Triumph offerings, as well as a few Honda CRFs. 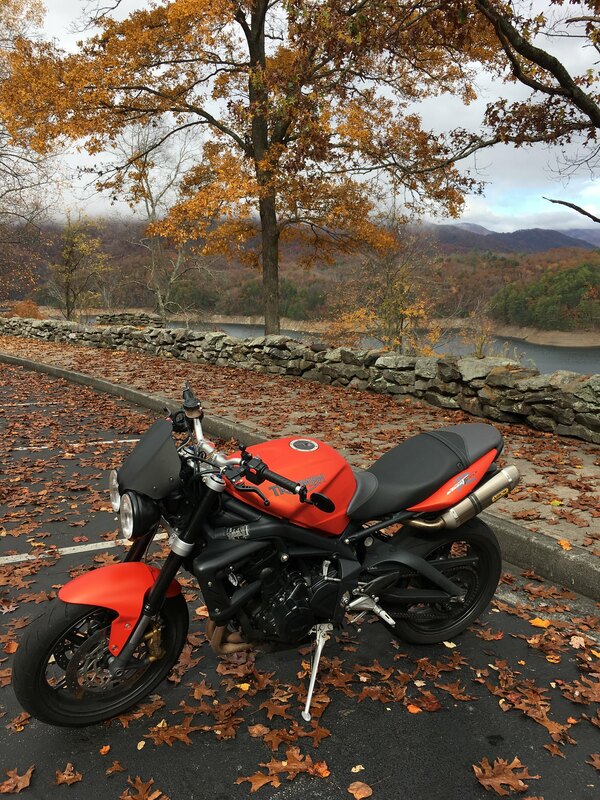 They will deliver, but I decided to pick my Street triple up from their garage. They keep all of their bikes well maintained and also do repair work on bikes for private clients. Their prices were great and the service was excellent, they even had a suction cup go-pro mount they attempted to let me borrow until we gave up trying to get it to stick to the matte paint finish on the tank. They were very helpful. The gentleman who co-manages the business is a former Navy guy and offered me a bit of money off after we started talking about my Air Force commitment after my residency training is finished. He gave me some for being Air Force and I gave it right back, in good spirit. Everything went very smoothly and prices were very reasonable. Here's me cheezin at the start of the Dragon, more pictures when I can get my photo-hosting back up and running.